After my trip to the market and excess of peppers the other day I made up this chutney recipe, the mix of red ingredients makes a vibrant coloured chutney, packed with flavour, roasting the peppers brings their flavour out and adds even more depth of colour. 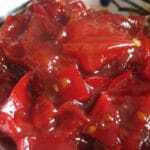 If you try this Roasted Sweet Pepper and Tomato Chutney please tag #FussFreeFlavours on Instagram or Twitter. It is amazing for me when for me when you make one of my recipes and I really do love to see them. You can also share it on my Facebook page. Please pin this recipe to Pinterest too! Thanks for reading Fuss Free Flavours! 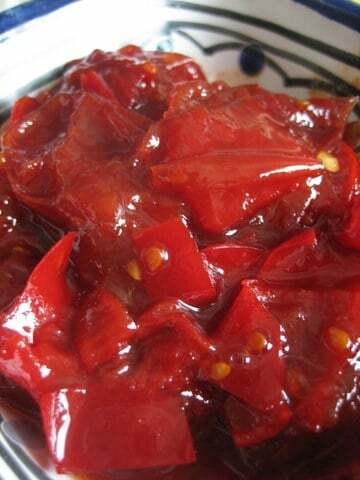 A delicious tomato and pepper chutney. Ideal with cheese. Makes about 4 jars. Roughly chop the tomatoes – if they are very ripe heat in the preserving pan until the juices have reduced. Meanwhile lightly roast the peppers in a medium oven until starting to blacken deseed and roughly chop, there is no need to peel unless you really want too – I find my life is too short to peel peppers for chutney. Add all ingredients to the tomatoes and bring to a rolling simmer. Turn the heat down and let mix reduce, when ready – anything between 40 mins to several hours depending how much juice was in the vegetables pour into warmed sterilised jam jars and seal down. This chutney goes well with hard strong cheeses.